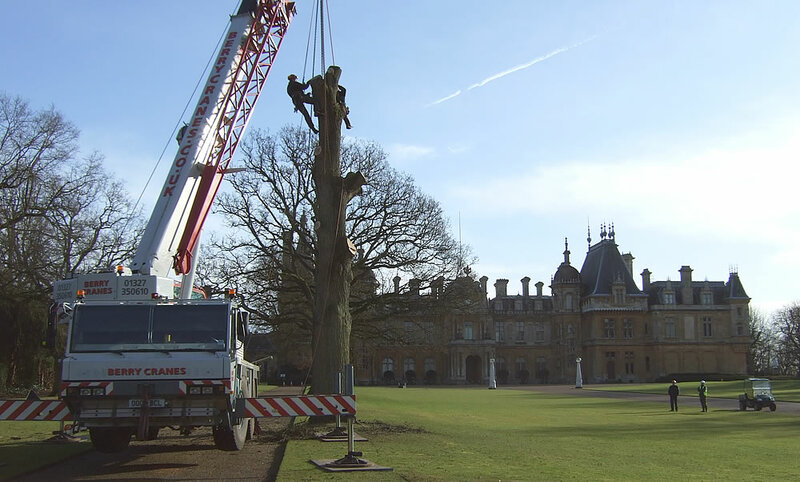 Tree Crane Work in Northamptonshire, Bucks, Oxfordshire and Warks. Tree crane work is one option if simply cutting down a tree is not viable. We use different methods of accessing the safety of a tree and during an inspection of the tree’s structure, growth habit, stability and growing environment it may be decided that for safety reasons of the public, and the climbers, that it is necessary to use a crane, a temporary work platform or a suspended work box. Before accessing a tree by any of these methods, a thorough inspection of the tree is carried out by one of our qualified arborists. A Risk Assessment is carried out and a Method Statement and all staff on site attend a meeting prior to any work commencing. At Tree Profiles Ltd we always maintain a high level of safety and have been carrying out this specialised tree felling using cranes and mobile platforms for over 15 years. We carry out our services in Oxfordshire, Northamptonshire, Buckinghamshire, Warwickshire and Bedfordshire. We are a member of the Arboricultural Association; we have been approved by Trading Standards and are a member of Buy with Confidence.